"We wear 20 per cent of our clothes 80 per cent of the time out of habit." We’re shedding winter’s weight, dark colours and heavy fabrics as we move into spring and summer. We want to up our SQ (style quotient) while maintaining the budget. Ridding ourselves of winter weight doesn’t mean just divesting ourselves of pounds put on since Christmas, it means losing the extra weight of the stress that having a messy, disorganized or clogged closet gives us. We need to lose the weight of the guilt we have as a result of keeping pieces that still have the tags on them because we’ve never worn them or items we’re hanging on to that are much too big or too small. All sorts of ghosts live in our closets, but Victoria Baird encourages us to rid ourselves of all this dead weight, so our wardrobes can reflect our present realities. “What you keep is holding you back if you’re holding on to a person, place or size you once were. Letting go is very freeing because it lets you be the best version of who you are today,” says the image consultant. In her business, Beautiful You by Victoria, she works with clients to clear their closet clutter, ensuring that they have head space and closet space to organize the remaining items into unexpected combinations and add select pieces. Baird starts her client’s closet detox process with an assessment form. You can replicate the experience at home by asking yourself some revealing questions: What do you like most about your body? Least? What three words describe the style to which you aspire? Who are your fashion icons? Do you impulse shop? If yes, what are the results? What are your personal and professional goals? Do you accessorize? Are you comfortable with/good at putting outfits together or do you wear the same items in the same combinations? Honestly answering these questions will point you in the right direction but then you need to dig in and try on each piece. Start by feeling confident with hair and makeup in place. Stand in front of a full length mirror or have a friend take photos of you. Use your cell phone to look at pictures side by side for a more objective assessment, advises Baird. Work in a space with good lighting to see if fabrics are faded or tattered. We often dress quickly and don’t notice. When you’re wearing each piece or outfit, decide how it makes you feel. Does it still fit well? Are the colours flattering? Does it reflect the three style words you chose? Does it make you feel like a person who is on the road to meeting her goals? Do you have accessories that will make it pop? Are there other pieces that will work with it to make a new combination? Use three garbage bags to sort the discard pile: garbage, donate, consign. “Once you have the bags ready to go, get them out of the house right away so you don’t second guess,” says Baird. 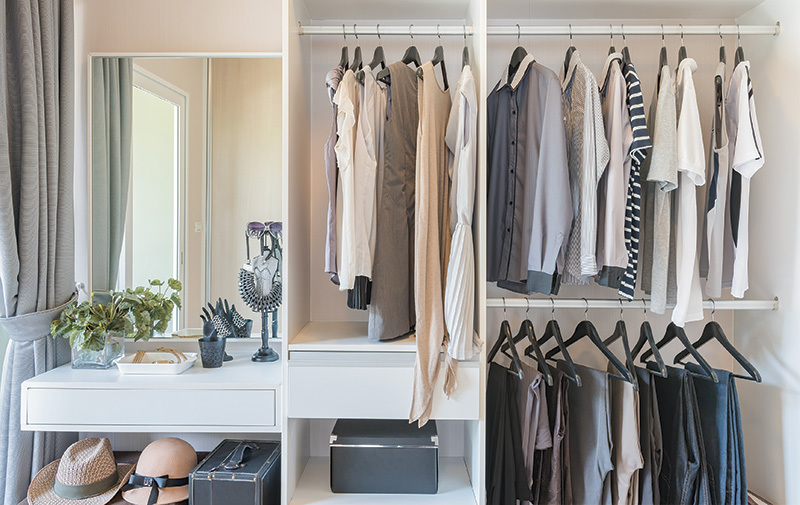 Now that the closet contains only pieces you love and make you feel great, write a list of items to purchase that will fill in the gaps. Will a brightly coloured pair of ankle pants breathe new life into that blazer? Will a different belt update that black dress? Will a new necklace or earrings be just the right touch to add sparkle to a favourite blouse? List in hand, decide on your budget. You’re not trying to fill the closet again but rather fill out your wardrobe so you feel like one of the fashion icons you admire. Allowing more space between clothing items is a good thing. When you’re shopping “having a list and a plan will help you avoid one-hit wonders,” says Baird. She discourages falling for sale items that can be only worn one way or for one season. “Also ask about the return policy before you purchase, so you can take it back if you get it home and it doesn’t work.” This will avoid having to pitch regret purchases in future closet detox sessions. You have the power to end the cycle. Adding “magic pieces” will update the staples in your wardrobe, according to Ariesen. Those magic pieces add interest to your outfit in the form of a deeply-hued or pastel top, a brightly coloured bead bracelet or a luxurious, long scarf in rich colours and modal fabric, “which is a new type of fabric that reflects colour beautifully,” she says. Her three years as an image consultant and 30 years working in the beauty industry have taught Baird that looking at things with a critical eye gives a new perspective. “By mixing and matching pieces, we were able to find 26 new outfits in a client’s closet,” she gives as an example. It’s time to detox and rock this summer as your own fashion icon.